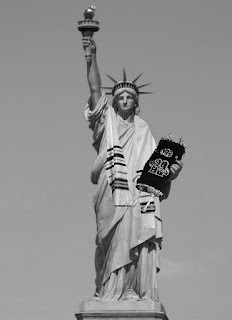 NEW YORK HARBOR - (@The Comedy News) - Today, the Statue of Liberty will celebrate the 112th anniversary of her Bat Mitzvah. On Saturday, October 28, 1899, the Statue of Liberty turned 13 years old. On that day, she read from the Torah as a Jewish rite of passage in front of her family and close friends. In attendance at Lady Liberty's Bat Mitzvah was The Great Sphinx traveling from Egypt, Christ the Redeemer from Brazil, Moai from Easter Island, and the entire population of New York City, which around 1900 was 3,437,202 people. Her first dance at her party after the ceremony was with Michelangelo's David, who dressed in only a kippah.